All transactions are safe and secure with a reliable history in online purchasing behind each of our associates. Buy the I Learned on the Street t-shirt to own Sesame Street clothing and merchandise. If you were raised on the street, don't worry we have you covered too. 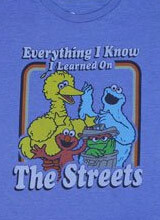 The Everything I Know I Learned on the Street Sesame Street t-shirt features Big Bird, Elmo and Oscar partaking in some less wholesome activities than say counting backward from one hundred or singing about the colors of the rainbow. Let's face it, not everyone that watched the show turned out to be a teacher, lawyer or doctor. If this style is not up your alley, then pick a more wholesome Sesame Street tee from the gallery or outfit yourself in a Sesame Street hoodie. See related stuffed animals, toys and hats by exploring the gallery. In addition to the I Learned on the Street tee above, browse the Sesame Street Clothing Gallery for more apparel like men's and women's clothes, kids shirts or hoodies.